Incidentally, Ozzie, Slash, and Flea are actually rock musician references, Ozzy Osbourne from Black Sabbath, Slash from Guns N' Roses, and Flea from the Red Hot Chili Peppers, which is why one of the townspeople refers to them as tone-deaf evil fiends. Anyway, make sure you had Spekkio teach Frog water magic before you begin, and determine who you want your third party member to be. Magus uses barriers of all the different magic types, and Crono and Frog have lightning and water respectively. 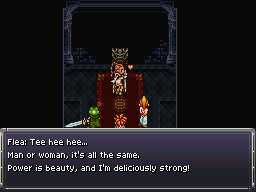 Marle would be redundant with ice magic, so I'd go with Lucca or Robo for fire or shadow. The beginning of Magus's castle is very eerie, simply follow both paths to their conclusion and come back to the save point in the center to greet Ozzie and begin taking on Magus's henchmen. Head down the left path for Slash, the right path for Flea. I'm going to go with Slash to start since you get a sword for fighting him. Take the left path to fight Slash. Talk to the Omnicrones in the next two rooms if you want to fight the skeletons. Get Mid Ether in the first room. In the last room with the sword on the wall, talk to the lady at the front of the room to fight the skeletons there. After you're finished with them, Slash will confront you. Attack, attack, attack: Does about 90 physical damage to one person. A close range fiery punch that does about 50 physical damage to one person. An energy wave attack, which does about 60 damage to everyone. 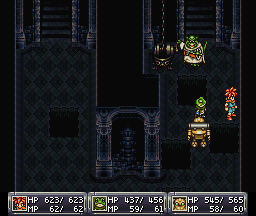 An attack which resembles Crono's Slash. Your opponent will position himself around the room so that it always hits at least two people, and does about 50-60 physical damage. Yes indeed! : Does about 90-100 physical damage to one person. A close range sword slash which does anywhere from 40 to 70 physical damage to one person. A leaping sword slash, which does between 120-150 physical damage to one person. You'll have to fight Slash in two parts: before and after he picks up his sword. Healing will probably be very important for this battle, if Frog knows heal you're set or if you have Robo with heal beam you can heal the whole party in a single turn, otherwise try the Aura whirl or have one party member use mid tonics or simple healing spells. Never let anyone's HP fall below ~100-120. Stick to attacks and physical techs. Use double techs as you desire, but don't bother if the dual tech damage is less than if both characters used single techs. Dedicate someone to healing. Frog's Heal heals all 3 party members, and if you equip him with Rage Band he can add to damage while healing full time. Give Crono the Silver Stud if you want him to use Spincut through the whole fight. Have Lucca cast Protect on everyone, which will mitigate Slash's attacks. You can succeed without Lucca, but this makes healing less important. At the end of phase one he will hit the entire party for low damage, so as long as nobody's HP is low enough to be blinking, you won't need to revive anyone. The second battle begins without giving you a chance to heal or use ethers. Slash will use more attacks, have more turns, and hit harder. This is why you don't want anyone's HP to fall below 100 in the first phase. After the battle, walk over and interact with the sword on the ground. You will pick it up. Equip Crono with the Slasher (but if you charmed Aeon Blade in 65M BC, then don't bother equipping it, Slasher is weaker than Aeon Blade). Also take the Mid Ether and Shelter from the two chests. That is NOT a Girl, but a MAN! Backtrack and go down the right path to face Flea. Talk to the bottom kid if you want the Barrier in the treasure chest, these monsters are pretty easy anyway. Keep going through the room and if you want to get into some more monster fights in before the boss, talk to all of the phantoms impersonating people close to your party members and don't forget to get Mid Ether on the way. You'll then run into a monster who's impersonating the magician Flea. Make sure whatever character kills it has low MP, since whoever finishes it off will have all their MP drained. On a side note, if you counter-attack a monster with a counter, its counter doesn't work so if you have the rage band equipped and it strikes you, you can kill it without getting your MP drained. After you beat the fake flea, the bat that was following you around will turn into the real, androgynous Flea. Flea casting Prism Beam/Darkness on party. Prism Beam ♡/Darkness: Damages the entire party (40-50 damage) and attempts to blind them. Waltz of the Wind/Chaos: Attempts to inflict Chaos on one person. Rainbow Storm/Wind of Poison: Inflicts about 50 damage to everyone and attempts to poison them. The Stare/Flea's Magic: Turns one character on the others - inflicts 80 physical damage to everyone. Used as a counter-attack to any magical attack on Flea. A sleeping bomb move which attempts to put one person to sleep. A weak ranged attack which inflicts 40 physical damage to one person and may put the target to sleep. If you're at low (i.e. normal) levels healing will be your biggest priority, although you can get by without a tech that heals all your party at once, you'll probably just have to spend a few rounds getting yourself back to full health before continuing, and make sure you save first. The first version of Flea is actually a Joker. One hit kills him, although he uses MP Buster as his parting shot. However, if you allow it to attack you first, and you're equipped with a Rage Band, you'll counter-attack it instead and it won't be able to use MP Buster. Now comes the real Flea. Not too difficult. Crono and Frog's X-Strike and Crono, Frog's and Robo's Triple Raid Triple Tech work very well here. Heal often, use powerful attacks and do it quickly, and you shouldn't have too much trouble. However, you will want to be quick about defeating Flea because he loves to use status-inducing attacks, e.g. Prism Beam/Darkness and Rainbow Storm/Wind of Poison and you will pretty much always get one person who gets inflicted with the associated status ailment. Flea's magical defense is also really high, and he has a pretty nasty counter-attack to it, so stick with physical attacks. Also, for some reason, Flea is less susceptible to physical attacks than Slash, but has less HP. After you beat Flea he'll leave behind a Magic Tab. Head back to the front of the castle and step on the save point to warp forward. You can skirt the edges of the room to avoid most of the monsters or run the gauntlet down the center to fight them. Pick up the Mist Robe at the end and give it to one of your favorite (or active) girls, then talk to Ozzie to chase him away. The next room will be full of conveyor belts and falling anchors, so run as you cross them and be careful. You can also walk against the conveyor belt to stay in place if you need more time to cross. Pick up the chests with Dark Mail and DoomFinger and chase Ozzie into the next room. The only way to trigger a fight in the next room is by running into the green ball, and previously mentioned you don't get into a fight with monsters unless you're moving yourself. So stay still to let it pass you rather than worrying about climbing the ladders. In case you fight a juggler, it alternates between physical and magical defense. If you hit it with a weapon it'll turn on its physical defense and disable its magical defense and vice versa. It can only have one on at a time, and it starts with physical defense on. Ozzie laid out one of many traps in Magus Lair. In the next room Ozzie will have a bunch of fake platforms that fall out of the floor, leading you to a pit filled with skeletons the first time. I'd recommend falling down at least once to pick up Mid Ether, Lapis, Shelter, Barrier and get the Magic Tab in the bottom right corner. There are four save points, one of which is real, one of which is a transport out, and two of which are monsters called ???s. The fake save points are an excellent source of experience and present no challenge, so fight as many of them as possible. You might want to use a shelter at the save point too since you're probably drained from Slash and Flea. Once you're through the room you'll pass into another walkway section where either the outlaws or the roly balls can get you into a fight. The next area will have sets of enemies arriving on chains, hopefully Frog has the heal spell by now so you can recover between fights. As noted before, the Jugglers switch between being immune to magic or physical attacks. Try to start off with a multi-target spell and finish them off. The outlaws will do a group counter-attack if you attack them while a juggler is still alive. Get Speed Belt from the chest and go in next room. The next room is another long hallway with a Revive at the end: you can walk around the statues or charge down the center to fight. Hopefully you have whoever is casting spells to kill the jugglers equipped with the Silver Stud. In the next room you'll finally get to fight Ozzie. Don't worry, it's a joke fight. Pick up the two chests with MagicScarf and Mist Robe, then engage him. Ozzie encases himself in a shield of Ice. All you have to do is attack the switches next to him, instead of attacking Ozzie himself. Hit each of the four in turn as you're able to target them and Ozzie will fall to his doom. If you do happen to attack him directly, he will counter your attacks. It is possible to "defeat" him, but the result is that Ozzie cannot be selected as a target and you still must attack the switches. Ozzie will continue to attack after his HP is gone. Two save points will appear, the right one of which will actually let you save. 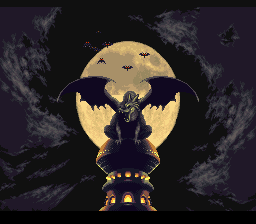 Race past some bats after transporting with the left save point, and you'll end up in Magus's sanctum. Hopefully Frog has Heal at this point, maybe even Leap Slash. Crono may very well have Lightning 2, and your third party member probably has some powerful fire or shadow magic depending upon whether it's Lucca or Robo. If you want to build tech points, running down the walkway and killing the bats is an easy way to do it. They should fall pretty fast to a multi-attack spell and you can recover at the save point. You may have to use these guys if you can't beat Magus on your first or second try. Pick your party, equip them however you'd like, and get ready to face Magus himself. 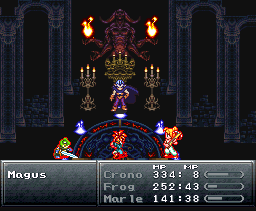 Magus vs. Chrono, Frog and Marle (with Haste cast). Lightning 2: Deals about 150 lightning damage to the entire party. Ice 2: Deals about 100 water damage to the entire party. Fire 2: Deals about 150 fire damage to the entire party. Shadow Bomb: Deals about 150 shadow damage to one ally. Dark Matter: Deals 250 shadow damage to the entire party. Geyser/HP Down: Does about 70 damage to everyone. A slashing attack which deals about 75 physical damage to one person. This is the toughest fight that you have had to face up to this point of the game. Magus's gimmick is that he will often change what type of magic he is resistant and weak to. These are referred to as magical barriers. Magus will routinely switch between Fire, Water, Lightning, and Shadow Barriers. Whenever a certain barrier is active he will only attack with that type of spell (level 2) and will absorb all magic not of that type. The barrier changes will be announced in the battle text, but a good rule of thumb is that the barriers are two way. If Magus is casting fire spells, only fire spells will work against him. For example, a Fire Barrier means he'll use the Fire2 attack and only attacks with Fire magic can harm him. Magus changes barriers each time he's attacked. When he does this, he will also unleash a spell with the new element that hits all of your party members. Between barrier changes, his intermittent attacks aren't as powerful, but he can slowly deplete the party with his Geyser/HP Down attack. If you're finding that he's always of a barrier type that you can't get through, then hit him with something like Crono's Spincut to force him into changing his barrier (but be prepared for the accompanying magical attack). With the barrier changes, you should hope that Magus chooses Shadow as often as possible, especially if you have Robo in your party. Shadow Bomb only hits one target, so the damage is minimal compared to Fire 2,Ice 2 and Lightning 2. If you have Frog in your party, a normal attack with the Masamune equipped will lower Magus' magical defence. A healer, or two, is very necessary for this battle. If you have Marle, then you can use haste (if you have it) which will greatly help in the battle, especially when he tries to cast Dark Matter. Try to bring a balanced party for attack magic, to ensure that you can penetrate most of the barriers. Frog with Masamune equipped should often use a normal attack because it lowers Magus' magical defense. Physical attacks can be used if you don't have magic of the particular type that Magus' barrier opens (e.g. Shadow damage is only dealt by Robo's techs). Try to heal fairly regularly when your health gets low with Frog's heal spell ideally. When you read the text "Magus risks casting a spell!" it means that none of his barriers are active and you can hit him with whatever you want, but it also means he's about to cast the ultimate magic attack, Dark Matter, on your party. At this point he won't have very much health to go, so just stay alive and keep hammering him. When you see "Magus risks casting a spell" he's dropped his defenses and is beginning to charge his Dark Matter on your party to cause massive damage. Heal before and after this spell and hit him with your most powerful attacks with whatever magic you want, since none of his barriers are active at that point. When you finally finish him off, Magus will inform you that he only summoned Lavos. Magus did not create Lavos. Lavos will begin to wake up and you'll all be sucked into a time gate and disappear. If you go back and challenge Lavos at this point, you should get The Frog vs Magus Ending. Frog will duel it out with Magus and his henchmen without your help, and the two will finish things off with a battle at the top of the castle. Also if you lose in the fight to Magus, you'll see a brief scene where he turns around and finishes summoning Lavos, and Lavos will make his trademark scream. This page was last edited on 24 August 2014, at 22:32. This page has been accessed 183,862 times.